Calavera, which is Spanish for Skull, is the first cenote you come to on the Coba Road 5 minutes from Tulum. The cenote gets its grim name from the 3 circular openings in the roof of the cave that resemble the eye sockets and mouth of a skull when viewed from above. Calavera is also known as Temple of Doom, the name of the cave system that it was once a part of. Sistema Temple of Doom was connected to Sistema Sac Actun in 2007 and is now a part of that gigantic cave system rather than a separate cave system in its own right. The dive begins with an adventurous 3m/10ft giant stride entry into the mouth of the skull. Floating at the surface you will see that you are in a large underground chamber only part of which you can see from above. This is home to Fruit Bats, Cave Swifts and Motmots which you will see above you roosting in the walls and ceiling of the cave. As you descend you will find a prominent Talus Cone (debris mound) in the center of the cenote and the start of the permanent Cavern Line beginning at a depth of 6m/20ft. Following the line leads deeper down the side of the Talus cone until reaching a depth of 16m/53ft at which point it then circumnavigates the entire cenote in the Cavern Zone. During the dive you will spiral back up the walls from this depth as you complete several circuits of the cenote so that you are able to see and enjoy as much as possible of this unique site. The light beams streaming down through the skull openings create a wonderful display and help to illuminate the white walls and formations of the cavern. There are many hidden nooks and crannies to explore and lots of fossils to discover. The diffuse and multilayered halocline creates many intriguing visual effects to enchant the diver. Maximum depth of 16 meters. Sun beams at midday trough the 3 holes make Calavera a mystic place. 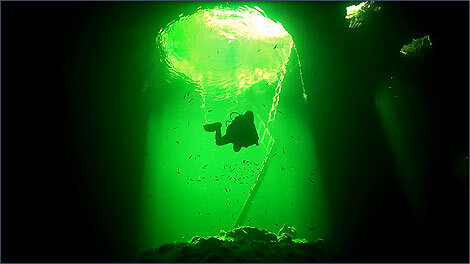 Very strong lights are a must on this dive. Positioning is hard because of the halocline.